Progressive San Diego City Council candidate Stephen Whitburn held a press conference September 7 to protest a new development proposal for the Hillcrest area that would erect two high-rise towers in a small-scale, intimate neighborhood, adding to traffic congestion and destroying the community's atmosphere. Developer Bruce Lightenberger, also interviewed, said he couldn't care less; he claims that as long as it meets existing zoning, he has an absolute right to build his project and neither the city nor the community can stop him. Flanked by about 20 community activists as well as city attorney Mike Aguirre, District 3 City Council candidate Stephen Whitburn called a press conference September 7 to denounce the latest incarnation of the controversial 301 University high-rise tower. Held in the parking lot of a mini-mall at 4th and University, one block away from the site of the proposed development, Whitburn and two community activists, John Taylor of Save Hillcrest and Nancy Moors of the Hillcrest Town Council and Hillcrest Business Association, said the new proposal for two separate towers on the site would add to Hillcrest’s already notorious traffic congestion and destroy the village-like character of the neighborhood. The original 301 University project was proposed in 2006 and approved by the San Diego City Council on an 8-1 vote, with District 6 Councilmember Donna Frye the only vote against it. However, a group called Friends of San Diego sued the city in state court to block the project on the ground that no environmental impact report had been done on it and it would forever change the character of Hillcrest. San Diego County Superior Court Judge Linda Quinn agreed, and issued an order blocking the project from going forward. The original proposal was for a 150-foot building; the new plans are for two towers on the same site, one 195 feet tall and the other 170 feet tall. Developer Bruce Lightenberger of La Jolla Pacific and its subsidiary, Urban Properties (UP), Inc., told Zenger’s that the project had been redesigned and made taller to reduce its “massing” on the site, so there would be a “punch hole” — a space — between the two buildings instead of a single frontage taking up the whole block. He also said that the new proposal would actually be smaller than the old one, even though it would be taller. Lightenberger said he is having an environmental impact review done on the project, but that the other parts of the 2007 court ruling don’t apply to him or his companies because they weren’t parties to the action — Friends of San Diego sued the city, not the developer — and because this is an entirely new project with nothing in common with the old one except that it’s designed for the same site. In fact, Lightenberger said that because his project fits in with the current zoning for the area, the city has to let him build it regardless of what the neighborhood activists say. Lightenberger is also confident that even if the community files a lawsuit to block his new project, he’ll win. He cited a precedent for a project called Los Arbalitos at 6th and Upas, whose developer prevailed in a community lawsuit at trial and won again on appeal. During his press conference, Whitburn noted that unlike the previous 301 University proposal, the new project offers no public parking. It was the prospect of additional parking in the neighborhood that persuaded the Hillcrest Business Association (HBA) to endorse the original 301 University in 2006 — breaking ranks with the Uptown Planners, the city-credential neighborhood planning group for Hillcrest and its surrounding neighborhoods, who opposed it from the get-go. Asked why the new proposal doesn’t include community parking where the old one did, Lightenberger said, “That was one thing I thought we had worked with the community on, and it came back in our face. By adding that [community parking], it added three stories to the design — and the community came back against us on that” [the total height of the building]. According to Lightenberger, the project will still contain commercial space on the ground floor of each building and residential units above — but the residences will be rental units, not condos as in the original project. 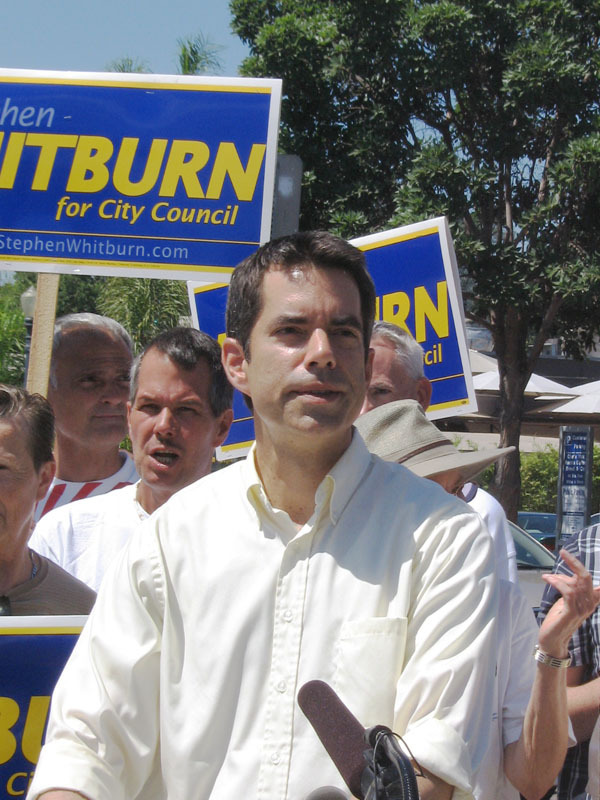 Whitburn tied in his opposition to the new incarnation of 301 University to his City Council campaign, and in particular his call for the Council to pass a “Neighborhood Right to Know” law, requiring that neighborhoods receive word of future development plans in time to mount an effective community response and be in on the permit process from the beginning. “Let’s work together to make sure that whatever is built here complies with the new height limit; that the public is involved in the process; that any new project makes this neighborhood better … and that our city government is working for the people,” Whitburn said.